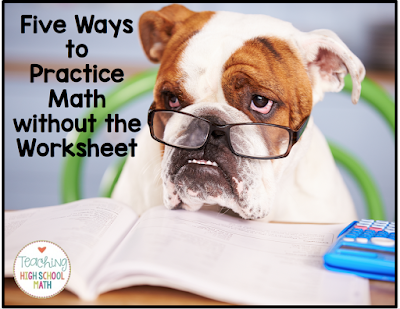 A start to the new school year is a great time to try out some new ideas in class. Here are 5 ways that you can have your students practice math without the worksheet. 1) Task Cards - I use task cards pretty often in my math classes. 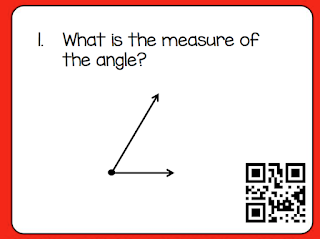 Usually, I use task cards that have QR Codes on them so the students can check their answers themselves. For some reason, my students love having the individual problems printed on cards instead of a worksheet. They love that they can use their technology to check their answers. Another great thing about task cards is that they work for all levels - they aren't too "babyish" for older kids and even much younger ones can get the idea of how to scan the QR Code. Here is an example of one of my task cards for Geometry - Measuring Angles.